The Egyptian regime is moving decisively to close what remains of public space, dominating all aspects of political life for decades to come. 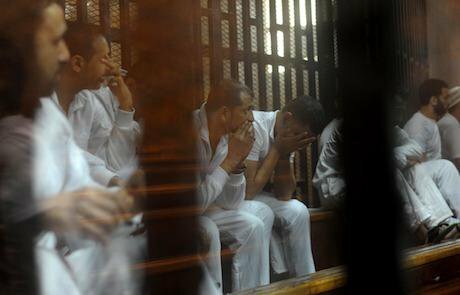 Egyptian defendants wait behind bars for the verdict in their retrial over a 2012 stadium riot in the canal city of Port Said at the police academy on the outskirts of the capital Cairo on April 30, 2016. Amr Sayed/Zuma Press/PA Images. All rights reserved.Over the next few months, the Egyptian regime is going to face a number of domestic challenges it has preempted and started to prepare for by initiating repressive legal and political campaigns. The first of these challenges is the transfer of the two islands in the Red Sea from Egypt to Saudi Arabia; a decision that has subjected the regime to considerable internal pressure from the opposition. The first mass protests since the coup of 2013 took place with the transfer of these islands. A legal battle, led by the potential presidential candidate Khaled Ali, to halt the transfer concluded with a victory, as the high administrative court deemed the transfer void. This placed the regime in a difficult situation, both domestically and abroad, as it was trapped between the need to maintain its legitimacy but also to meet its obligations to regional backers. The regime’s response since has revolved around attempts to legally repress the opposition in all its forms. The presumptive presidential candidate Khaled Ali was arrested on the charge of obscenity in a public space. If convicted, he would be disqualified from running in the 2018 presidential elections. The political repression of secular parties is also part of this pre-emptive campaign. The regime has embarked on a campaign of arrests of activists and members of smaller secular parties with the goal of immobilizing them before the presidential elections in 2018. By doing so, the regime is not only avoiding public confrontation or backlash - if they were to arrest more senior members - but they are also hampering secular parties' ability in conducting effective campaigns on the ground. Even though Khaled Ali, a senior political figure, was briefly arrested, his arrest was an aberration from the regime’s strategy thus far. This may be why he was quickly released, unlike junior members of secular parties who languish in prison. More interestingly, a new law for the selection of the heads of four of the most senior members within the justice system was approved. This changes the old procedure, which was based solely on seniority, where the judicial bodies selected their own heads. It now stipulates that three senior judges are nominated and the president makes the final selection. This was widely seen as an attempt to further erode what was left of judicial independence, but also to punish Judge El Dakrouri, who was responsible for the ruling against the regime in the Red Sea Islands case, and who was due to take over as the head of the State Council. The response of the State Council was one of defiance, as they refused to nominate three judges based on this new law and only nominated El Dakrouri. There are indications that the regime will simply ignore the courts and send the treaty to parliament for direct ratification. The regime has attempted to tighten its grip on civil society by issuing a new law that imposes severe restrictions on the operations of NGOs. The most prominent feature of this new law is the creation of a new body, dominated by the security apparatus, which approves and controls the flow of foreign aid to NGOs and restricts their ability to conduct research and opinion polls without approval from the above mentioned body. The law imposes heavy financial fines and jail time for simple administrative violations, such as moving the headquarters of an NGO without permission, or working with foreign funders without authorization. The law also limits the ability to receive cash donations by placing an upper limit of 10,000 Egyptian Pounds, anything more than that would require a cheque. In a cash economy, this places considerable bureaucratic hurdles on the process of fund raising. Thus, the regime’s drive to clamp down on NGOs that provide crucial services the state is unable to provide is a part of its attempt to centralize power as well as eliminate any possible competing authority centers rather than coopt them into the existing power structure. It is important to note that Islamists, most notably of Salafi orientation, dominate a large part of local NGOs. The most prominent example of which is Al Gamea al Sharaaya, established in 1912 and one of the largest and oldest NGOs in the country. The new law can be seen as an attempt by the regime to tighten its grip on the Islamists that are still operating in the public sphere. This clamp down was also followed by a public spat between the regime and Al Azhar, another power center that is not under the direct control of the security apparatus. Even though Al Azhar has generally been supportive of the coup, with a tense relationship with the Muslim Brotherhood during the Morsi presidency, it has also shown a penchant for open disagreement with the regime. Al Azhar, for example, was critical of the violent dispersal of the Muslim Brotherhood sit-ins in 2013. It also refused to declare IS apostates, despite public calls to do so. Moreover, it publicly defied the president when a change in the procedures for divorce, from oral to written, was suggested - highlighting the need to separate religion from politics. The regime’s attempts can be constructed as an integral part of its goal to centralize and control all public institutions that have been widely supportive of it, but have shown a degree of independence. This is coupled with the blocking of a number of prominent independent news websites, most notably Mada Masr, as the regime attempts to control the narrative, especially since the transfer of the Red Sea islands appears to be imminent. Based on the above one could argue that the regime is moving to create a totalitarian form of rule, where the security apparatus would come to dominate all aspects of political life. This would include the cooption and repression of parallel power centers, who even though have shown their allegiance have, on occasion, shown a degree of independence. This would also include the repression of smaller groups who do not have a real chance of overturning the regime; however any form of dissent is not tolerated in the slightest. The regime is moving decisively to close what remains of public space with the aim of completely dominating all aspects of political life for decades to come.